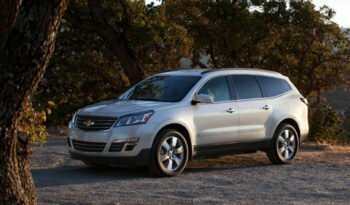 The new Chevy Traverse was built to appease the necessities of the modern family, while still maintaining the comfort of a luxury midsize SUV. Combining top-of-the-line safety features with advanced technology, the Chevy Traverse gives you everything you need in order to enjoy every adventure you embark on. Equipped with 6 standard airbags and available options including rear cross traffic and forward collision alerts, you’ll be able to hit the road with confidence and security. Created with ample cargo space and a convenient power-remote liftgate, packing up the kids has never been easier. Keep every passenger captivated with multiple USB ports and an available rear-seat entertainment system. The new Chevy Traverse offers style with a polished exterior, as well as a refined interior, making you feel at home no matter how far away your journey may take you. For more info on the new Chevy Traverse click here.